"pyrite." YourDictionary, n.d. Web. 10 April 2019. <https://www.yourdictionary.com/PYRITE>. A brass-colored mineral, FeS2, occurring widely and used as an iron ore and in producing sulfur dioxide for sulfuric acid. Also called fool's gold . Also called iron pyrites . Middle English perides, pirite from Old French pirite from Latin pyrītēs flint ; see pyrites . A silver to yellow, metallic, cubic mineral. Pyrite often crystallizes in cubes or octahedrons but also occurs as shapeless masses of grains. It occurs in most types of rocks, and is used as a source of iron and in making sulfur dioxide. It is a polymorph of marcasite. Because of its shiny look and often yellow color, it is sometimes mistaken for gold and for this reason is also called fool's gold. Chemical formula: FeS2. (mineralogy) The common mineral iron disulfide (FeS2), of a pale brass-yellow color and brilliant metallic luster, crystallizing in the isometric system. 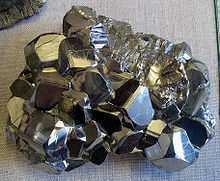 (usually as a plural: pyrites) Any metallic-looking sulphide, such as the above, which is the most common. (solid state chemistry) (usually as a plural: pyrites) Any metal dichalcogenide that is isostructural to the common mineral. Copper diselenide can occur both as a marcasite and a pyrite. It is often said that this saline change is more characteristic of marcasite than of pyrite, but according to H.
Pyrite, FeS2, contains 46.7% of iron. Other mineral products are graphite, garnet used as an abrasive, pyrite and zinc ore.